Really? Really? Can Mac really be 10 months already? I can't believe it! Where has the time gone? 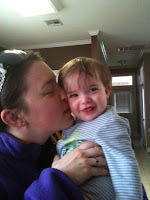 I cannot express how much I LOVE being a mommy... even though he won't say "mama", but says "dada" all the time... haha! Mac is all over the place. He crawls faster than most people walk and he's getting really close to walking on his own. He can walk just fine holding just one hand and when he doesn't realize it, he has taken up to 4 steps on his own. However, he immediately hits the ground to crawl once he notices that nobody is holding him. 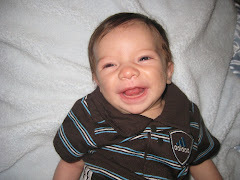 He has 4 top teeth and 2 bottom teeth. He wakes up smiling and stays that way for most of the day. He loves to be outside and got in the pool with Mommy and Daddy for the first time on May 14th. He loved to splash the water with his hands. He continues to love riding in his wagon and it's always a great way for him to spend time with his friends... haha! Of course, he still loves to dance. He will stop whatever he is doing when he hears any type of music, even a commercial's jingle. 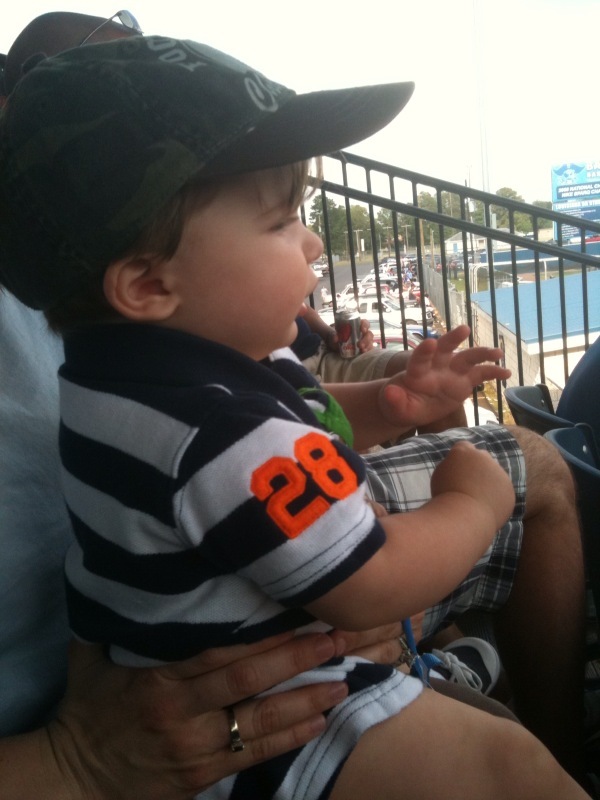 Mac also recently attended his first baseball game and watched Barbe beat North Shore to advance to the quarter-finals. Probably the highlight of the past month was experiencing my first Mother's Day!!! 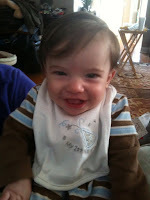 I feel so blessed by God to grant me such an amazing son and allow me the joy of being a Mommy!!! Wow! Mac is already 9 months old! I can't believe how the time has just flown by. He is such a bundle of joy to have in our lives. He is ALWAYS smiling and dancing. Boy, can he dance! 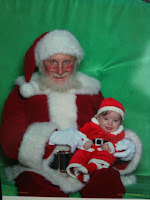 The minute any kind of jingle comes on the tv, he starts to either sway his upper body or start bouncing. He is so cute! He has also hit some more milestones. 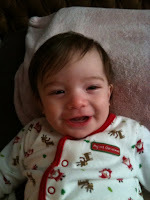 He now has 2 bottom teeth with the top teeth starting to show a little bit. 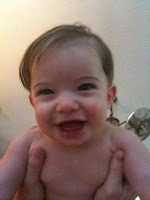 He just got his 2nd haircut... yes, I said 2nd haircut. His hair grows faster than anything I've seen. 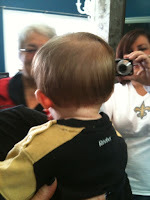 He got his first haircut on March 6th and his 2nd haircut on April 18th. Emily Gentry Spears, who cut his hair the 2nd time, said that it was her first time to have to layer a 9 month olds hair... muchless a boy! How crazy is that!?! I didn't even get my hair layered until I was in high school... haha. Anyway, Mac is already starting to walk with one of his rolling toys. He crawls all over the place, pulls up on anything sturdy or unsturdy he can find and walks anywhere he can walk while holding on to something. My husband started walking at 10 months old, but I'm thinking Mac may beat him. Easter was such a joy because not only did we celebrate our Savior's resurrection, but we got to do it as our own little family this year! We took some family pictures with my little man in his all linen suit! He was so handsome! 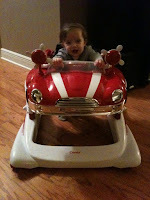 We also got him his first wagon, which he loves to go riding in! And, he had his first trip to play at the park! I hope you enjoy the pictures below as you get to see my love grow! Mac is 8 months old!!! Where does the time go? He has finally cut his first tooth, but thank God he has not bitten me yet! I pray that he never does! 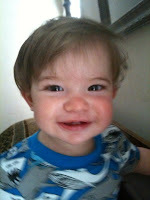 He cut his bottom, right tooth and is working on his bottom, left tooth. 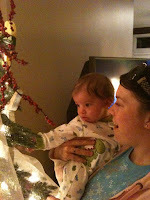 He has also started crawling and of course getting into everything. He loves to crawl to the tv and pull down all of the dvds he can reach. He started with the most precious and efficient Army crawl, but finally pushed up to all fours. 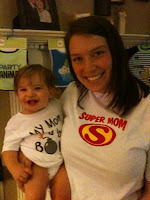 I got to celebrate my first birthday as a mommy and I loved it! I also gave Mac a little taste of icing for the first time, which he loved! If you know my husband, then you know that he thinks he's 100% Irish just because his last name is Fitzgerald. So, you know he was excited to celebrate his first St. Patrick's Day with his little man, which of course we had to take a picture of. 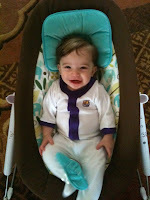 I can't believe that I am blessed enough by God to get to know the joys of motherhood! I thank Him everyday for my precious bundle of joy! Enjoy the pics! I absolutely CANNOT believe that Mac is already 7 months old!!! It seems like time flies by so fast. He is such a joy to have in our lives. I fall more and more in love with him everyday!!! It seems like there's such a difference from 6 to 7 months. Mac finally rolled over from tummy to back! 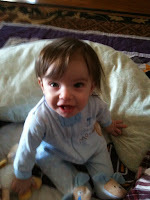 He has started to get up in the crawling position and sway back and forth, but not actually crawl yet. To be quite honest, I'm okay that he's not crawling because I'm not sure that I'm ready for him to be into everything. Mac's doctor told me to get on all fours and crawl around at his level to see any dangerous things on the ground. It's crazy what all is lying around that are choking hazards. Anyway, one thing that Mac has been doing a lot of that I LOVE is dancing. It is so cute! Anytime he hears music or you sing, he starts moving from side to side and sometimes flaps his arms. It's the sweetest thing ever! Scott says that Mac gets his dancing abilities from him, but I beg to differ! 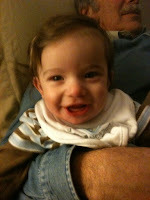 Mac is still teething, but we don't have any teeth that have surfaced yet. 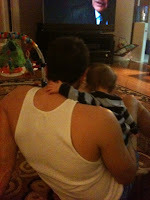 Again, I'm okay with this too because I am still nursing (along with him getting cereal twice a day). We finally got Mac's hair cut, which was in desperate need of a trim. We had my hairstylist, Deanna Knighton (Strandz Salon), cut his hair on February 6th! Deanna was so sweet and came to the hospital the day I gave birth to Mac to do my hair and makeup and make me all pretty for the big day! Now, Mac looks even more like a little man with his new do. Speaking of new, Mac's eyes seem to be turning brown. They are brown in the center and blue on the outside, so we will have to see how this progresses. Scott has brown eyes and I have hazel eyes, so who knows what he'll end up with. One thing I'm extremely grateful for is that Mac has started sleeping from 10:30 pm to 8:45 am!!! He is such a great baby!!! Again, I LOVE HIM SO MUCH! P.S. 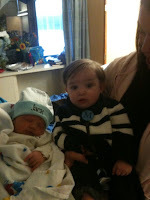 Mac's best friend was born February 12th, Jack Cristopher Sanford!!! Half a year!!! Where has the time gone!?! We have hit many milestones this past month! Mac is now rolling over; however he only will roll over from back to tummy. Dr. Wallace said that he can roll over from tummy to back because it's easier, but just doesn't have a need to (especially with all of us at his beck and call). He's already starting the crawl process because he bends and straightens his legs nonstop while on his tummy, but he just hasn't gotten the whole push up with arms part. 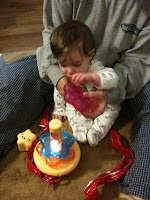 He started sitting up (upper left picture) and can hold it while playing for quite a long time. It's so cute to watch him because if he starts to fall he'll try to catch himself. He's such a joy to have in our lives! I made it nursing exclusively for 6 months, so now it's time to start introducing cereal. Mac didn't like the cereal at first, but we didn't mix it with any baby food, so I don't blame him. Once we mixed in some vegetables, he ate it like he had been eating for months. I'm quite surprised he ate it at all because my husband bought the organic, whole grain, brown rice cereal... yuk! Mac attends "school" every day (lower left picture). His "school" is the Your Baby Can Read video series. Hopefully I'll be able to post some pretty cool videos of him in a few months. 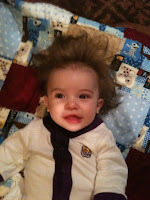 He will not be able to wait for his first birthday to get a haircut (lower right picture) because his hair is so long! When pulled down in the front it hits below his nose and in the back it falls below his collar. I cannot wait any longer Anyway, Mac is ALWAYS smiling! He never seems to meet a stranger! He has the best temperment! He is extremely ticklish! And he is FULL of love! 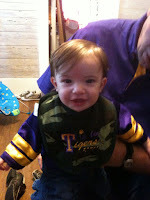 Here is my little Tiger (true fan... not a fair-weathered fan) cheering on his team New Year's day! After such a great year for 2009, I cannot wait to see what God will do in 2010!!! 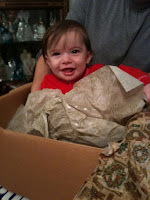 Here is a picture my mom took of Mac opening his first Christmas present on Christmas Eve!!! Mac turned 5 months old today and what a blessed day it was! We had baby dedication at our church, Water's Edge, and it was so awesome. 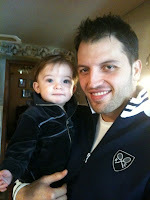 Tony, our pastor, really spent so much time to make each family feel special. He called each family up one at a time while 2 pictures displayed on the screen, presented us with a Bible and a certificate that contained a special scripture verse picked out just for our baby and then prayed over us. It was such an intimate time to spend dedicating our baby's life to the Lord! The verse given to Mac was Proverbs 22:6 "Train a child in the way he should go and when he is old he will not turn from it". This past Thursday, Mac was baby Jesus in the Christmas play for Poise-N-Ivy Preschool & Kindergarten. I was so worried about him staying in the manger, since sometimes he gets spoiled and doesn't want you to sit down. However, he did a great job. He was very content and just took the whole thing in. I think he really wanted to play with the gifts the wise men put in the manger with him, but they were just out of his reach. It was so funny when the little drummer boy played his drum for him because Mac flinched and tried to get a little farther away over drumbeat. It was such a great night! So many things have changed this month! Like flipping a light switch, Mac decided it was time to almost turn over. 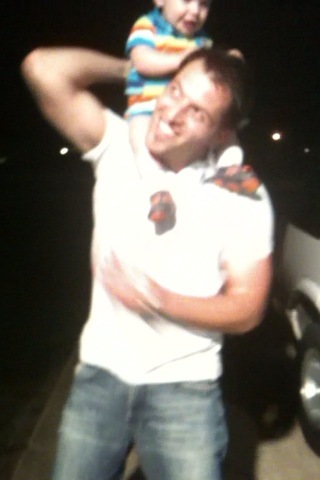 My mom was changing his diaper and he grabbed Scott's finger and flipped over like he had been practicing it for weeks. He still can't do it by himself, but he seems to be very close. He's now getting into the hurting phase of teething, but Scott found some natural supplement to give him, which works wonders. He likes to "sing" himself to sleep when he's really tired, which is just the cutest thing. It resembles a no-tear cry with rhythm. He likes "Twinkle Little Star" and playing peek-a-boo, which for some reason, my family has always called pee-pie. He smiles from the time he wakes up to the time he falls asleep and laughs at almost anything. He only cries if he's really hungry, really tired or hurting from teething. If you aren't around him alot, you have probably never heard him cry. He's the most content baby and is not affected by strangers at all. He can sleep through just about any noise... even the crazy, loud, Cajun woman who insisted on yelling at the Saints throughout the game while standing right over my sleeping baby! Anyway, as you can see, we are truly blessed by this wonderful gift God has given us! I can't imagine any other 5 months in my life meaning as much as these past 5 months!!! 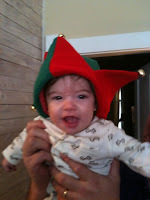 Doesn't a baby make every holiday so much more special!?! 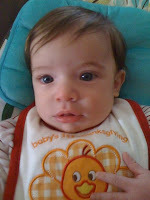 Here's a picture of Mac at his first Thanksgiving! OMG! Can it really already be 4 months since I gave birth my little baby boy!?! It's amazing how much you can love something. I never really believed in love at first sight until I realized that it was meant for your babies. It truly was love at first sight. Mac makes everything so special in life and changes everything you've ever known. Scott and I went to the mall the other day and started laughing when we r ealized how much Mac had changed everything in our lives. We were no longer interested in things for ourselves, but kept being drawn to the baby section to look at clothes or toys. I thank God for the blessing of Mac Scott Fitzgerald! He is such a good baby. 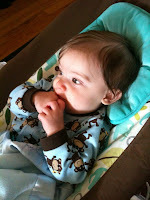 I am still nursing him fully and will hopefully stay that way until he's 6 months old. He nurses at 10 pm and sleeps all through the night until 6 am (he has actually been doing this since he was about 3-4 weeks old). He started laughing a couple of weeks ago, but would be extremely stingy with his laughs for other people. Now, he laughs all the time. For some reason, he always laughs when I say "Hi Baby". I'm not sure why he thinks that's so funny, but it never fails to get a laugh. 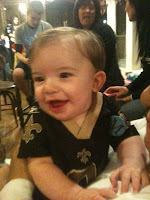 He loves to watch football and will stretch his neck as far as needed to get a glimpse of the game. He "talks" so much and is probably the first successful thing to get my family to stop talking and actually listen, which is a huge deal since we all ta lk at the same time! He also gets his exercises in everyday, which include sitting up in his Bumbo, tummy time and standing with someone holding his hands. I couldn't imagine life without Mac and thank God that I get a front row seat to see the amazing things He has in store for his journey! 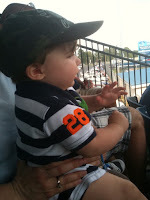 As always, here are some pictures of my little man! I am extremely late in posting Mac's Halloween pictures. 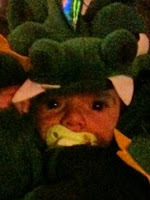 Due to so many cute costumes, I could not decide on just one costume, so Mac was many things. He was a dragon for most of the night since it was cold and his dragon costume was really warm and padded. 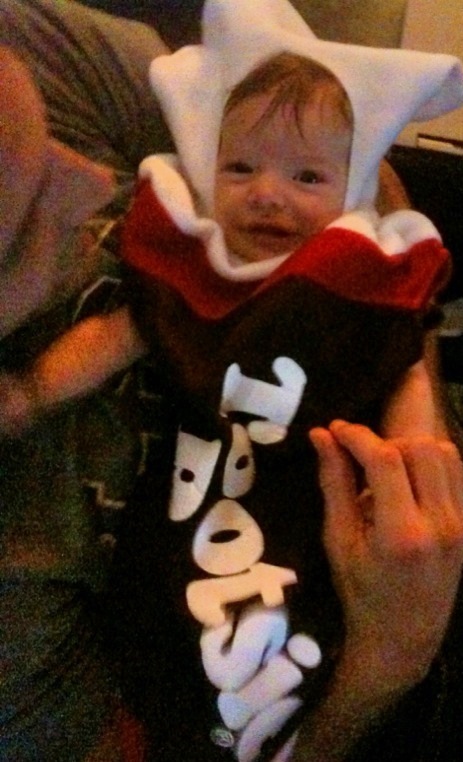 Mac was also a tiger (this year's most popular baby costume in our area), a tootsie roll and Drew Brees. 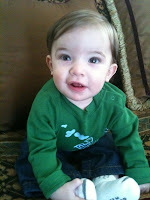 Here are some pictures to see my cute little man! 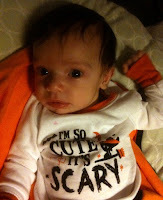 Here are a couple of pictures of Mac in his regular Halloween clothes. He's just so cute! 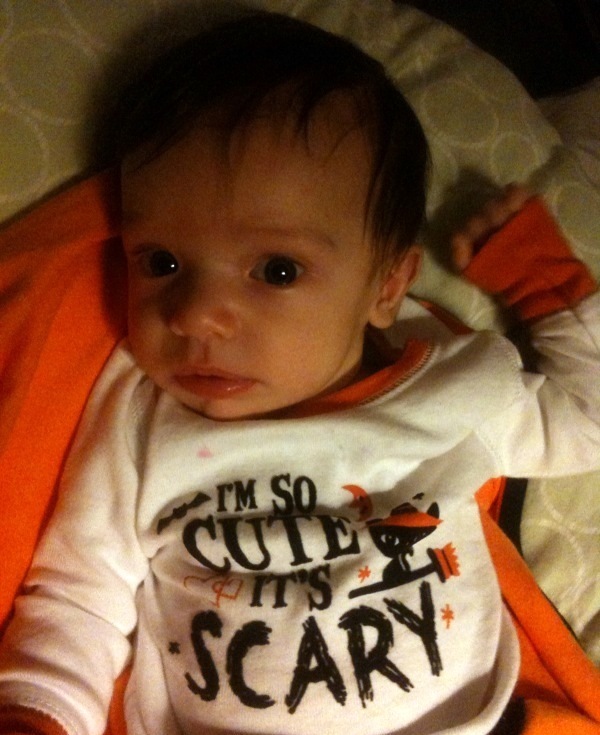 My little man... 2 months old!!! "What I have cleansed, you are not to call common..."